Seeking a modern and minimalistic look? 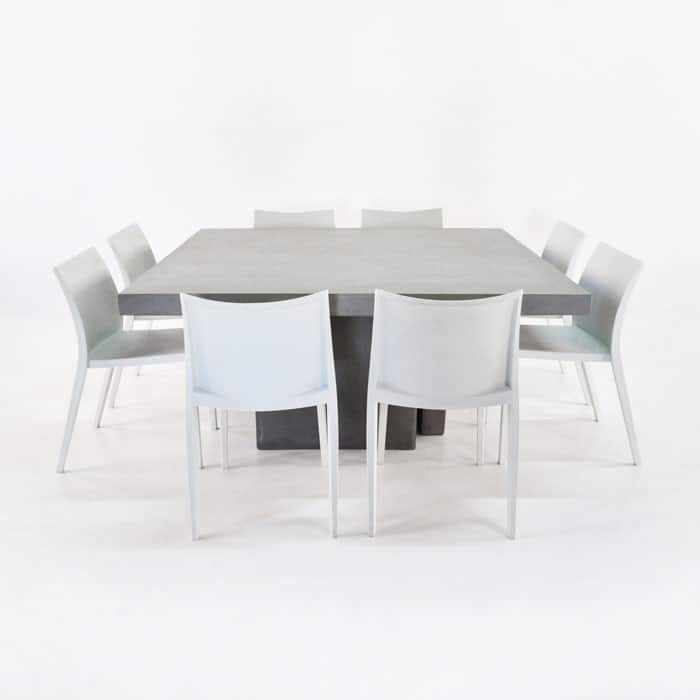 Design Warehouse’s Square Raw Concrete Dining Table and Chairs Set features a soft blend of raw concrete and slick Super High-end Plastic chairs. This contemporary dining set features a 1.6m Raw Concrete Dining Table (square) which easily seats up to 8 people, but can be pared back for a more expansive feel. This is a table that makes a statement, the huge slab of concrete composite rests on layered box legs, which resemble a square pedestal base. 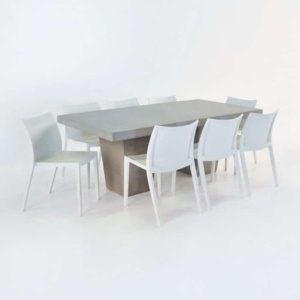 The Box Chairs let the table speak for itself, shown here in white, they are a popular seating choice at Design Warehouse; simple lines, easy to stack and clean – they are perfect inside and out. We often sell these convenient chairs to commercial properties because of their low maintenance and simple, chic look. Seeking a modern and minimalistic look? Design Warehouse’s Square Raw Concrete Dining Table and Chairs Set features a soft blend of raw concrete and slick Super High-end Plastic chairs. This contemporary dining set features a 1.6m Raw Concrete Dining Table (square) which easily seats up to 8 people, but can be pared back for a more expansive feel. This is a table that makes a statement, the huge slab of concrete composite rests on layered box legs, which resemble a square pedestal base. 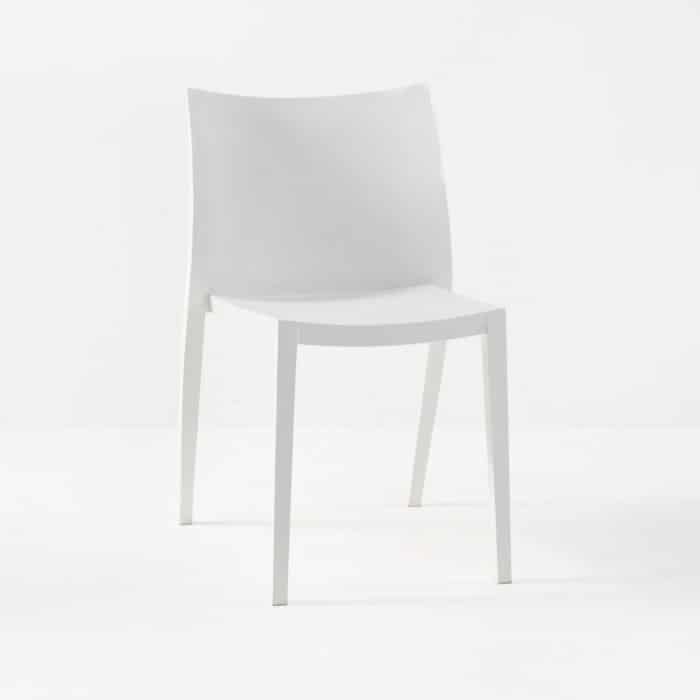 The Box Chairs let the table speak for itself, shown here in white, they are a popular seating choice at Design Warehouse; simple lines, easy to stack and clean – they are perfect inside and out. 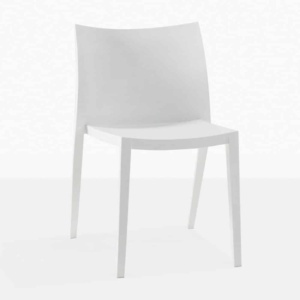 We often sell these convenient chairs to commercial properties because of their low maintenance and simple, chic look. The Raw Concrete range at Design Warehouse are actually a composite with fibreglass and resin, meaning that the products are lighter and yet stronger than 100% concrete. You can still expect each item to look and wear like concrete, developing a gorgeous weathered look over time, unless you continue to treat and seal the items. Our fabulous Box Chairs are made from polypropylene and resin, UV treated so they won’t change shape in the sun, they are also super easy to clean. You can either hose them down or wipe them with warm water, cleaning fluid and a sponge for more stubborn dirt. Add this amazing Square Raw Concrete Dining Table and Chairs Set to your garden area for a modern influence that doesn’t detract too much from your flora and fauna. Place some of our teak benches around the area as well for more options and flexibility when you have more dinner guests. This contemporary dining set also looks fantastic indoors as well as out. Place on your hardwood floors in the midst of your dining area for a superb area that your guests will delight in and envy! Design Warehouse specializes in a great range of patio, garden, seaside and poolside furniture; talk to us today about your needs. We guarantee that you’ll be impressed with the quality at amazing wholesale prices. From concrete to teak; we have many different materials and even more styles. In short; we have something for everyone! 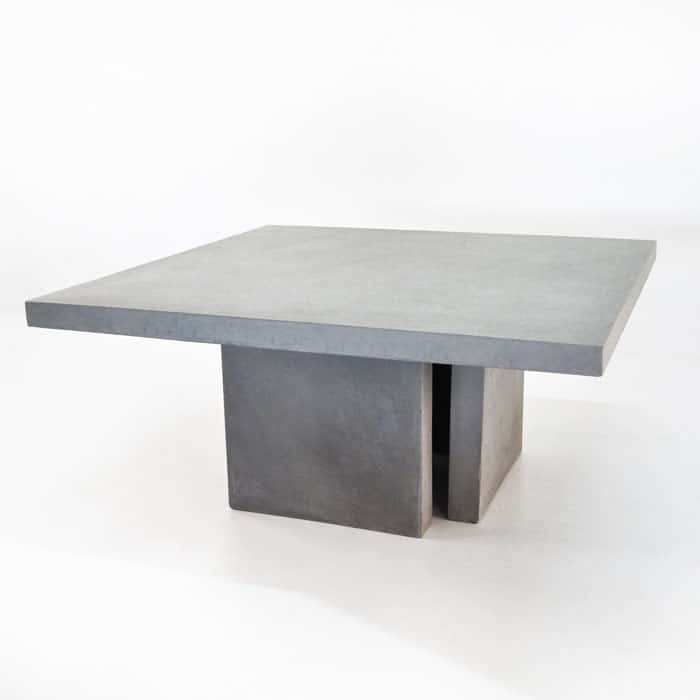 Our Square Raw Concrete Dining Table and Chairs Set is just one of our many collaborations. Pieces are sold separately. Mix and match as you see fit; try teak or Batyline® mesh with the table, or pair up the chairs with some recycled teak.